Beauty is more than fur deep. National figures from Cats Protection show that black cats typically take 22% longer to find homes than cats of other colours, yet in 2015, black or black and white cats made up 45% of all cats cared for by Cats Protection. Black and black and white cats often get overlooked for homing. This bias may be historic, with black cats associated with witchcraft and particularly with the notorious Salem Witch Trials. 18th century pirates also believed that if a black cat walked towards them it brought bad luck. Cats Protection are keen to stress that black and black and white cats have just as much love to give as cats of other colours and make equally good companions. The Ely and District branch currently have two litters of kittens where the only ones not reserved are black. 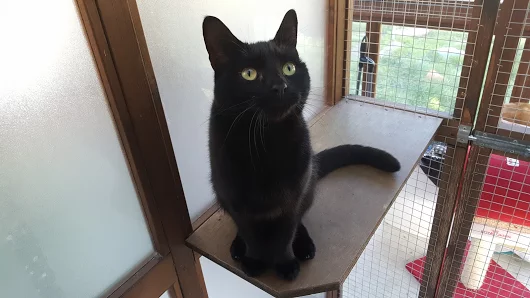 One adult black cat currently in the branch's care is Tulio (pictured), a 2 year old black male. He is a very friendly boy who is good with children and other cats. He is looking for a loving home outside of Ely City. If you are able to adopt a cat, please get in touch.